Speaking on the BBC’s World Football Phone In, journalist Tim was asked by a Brighton fan on his thoughts on the 20-year-old Argentinian playmaker. “He can dictate play from deep and he gets in the box as well, good timing of his runs into the box. The question mark against him for Premier League football is how physically slight he is. They’re a fairly small breed, the Mac Allisters; his old man was a little bit squatter than he is. so that’s the big question mark against him, whether he’s going to get crowded out in Premier League midfields. Tim has lived in Brazil since 1994 and is considered an authority on football throughout South America, frequently writing for the BBC, ESPN and World Soccer magazine. 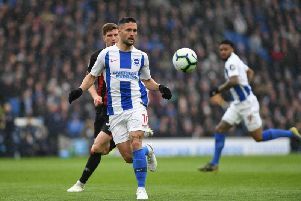 He has seen many players from the region move to Europe and believes Brighton would have been better served bringing Mac Allister over now despite being unable to play him. He said: “When Thiago Silva came across, the great centreback from Brazil to Milan, they couldn’t use him for a while so they just trained him for six months and they taught him how to operate in European football. He’s quick but in Brazil he played very deep as they often do, the defensive lines, so they had six months to drill him, drill him, drill him and by the time he could play he already been bedded in on the training ground. I wonder, for a club in Brighton’s situation, whether it might not be better to bring him over now and just let him settle in off the field, get him on the training ground and work with him and so, by the time his first team opportunity comes at the start of next season, everything’s not strange to him. When asked by Brighton fan Russell about sending Mac Allister on loan to a European club as part of the transition process, Tim wasn’t keen on the idea. “The problem with that is that I’m always suspicious of loan deals. When a player comes across and he’s loaned out to a club who don’t have any long term stake in him, they just don’t care if it doesn’t come off - he’s not important to them.